There's a old saying (I'd like to think it's Jewish, but I haven't verified it) that you can't judge someone until you've walked a mile in his shoes. And since that can neverhappen, as you can never live all someone's experiences for yourself, it follows that you can never judge someone else. And since it says you can't ever judge someone else, you never will, right? Obviously not! Where am I going with this? Today I attended the funerals of the four holy Jewish souls who were murdered in Paris this past Friday. They were targeted and shot for the crime of buying food for shabbat, for being Jewish. After the horrors of the Charlie Hebdo massacre, there was a palpable sense amongst the people I spoke with that thought, "But what about the Jews? Is it possible that for once, they really weren't the target of the hatred and violence of the radical Islamic terrorists in France?" Of course, one day later, we were to find out that it was only a temporary reprieve, that of course the Jews would remain the primary target of violence in France, and that anti-Semitism would continue to flourish unabated in that continent of Europe, with a Jewish history so complicated it hurts one's head. On Friday, the Jewish community of France was dealt yet another harsh blow, another horrific attack on a community that has seen more hatred and fear for being Jewish than nearly anyone in the last decade. These French Jews, numbering over half a million, mostly already refugees from their original homes in Morocco, Tunisia and Algeria, fearing the prospect of becoming refugees again. I devoured every article and scrap of information, as I always do, wondering aloud how and why these Jews hadn't already made aliyah, or why they weren't packing their bags as fast as they could. I couldn't fathom why on earth they would stay in place that kept punishing them for being Jewish. I judged, and I never even got close to walking even a step in their shoes. A little background into where my shoes have trod. I grew up going to Orthodox Jewish schools, camps, Passover programs and Sunday activities. I lived in New York City, where everyone I knew was Jewish and if they weren't, they knew all about us. I had off for every Jewish holiday through college, Spring Break was always over Passover and I never had to explain to a professor what Rosh Hashana was. My dad could wear a kippa, tzitzit hanging out, while praying on a subway and no one would say a word. I can't remember a single incidence of anti-Semitism in my general vicinity at any point in time in my life. I'm not saying these things to brag or to let myself off the hook. Quite the opposite. I am telling you this so you can understand how thoroughly I can not relate to being a Jew in Europe, and especially not France. And yet I judged, and I am so regretful. 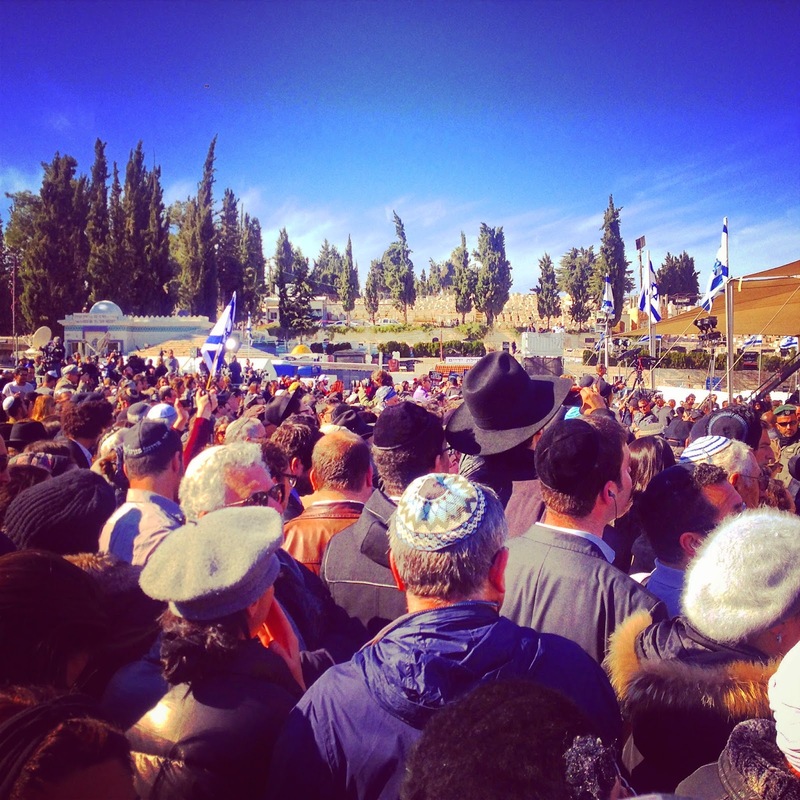 Today I went to the funeral, where the vast majority of mourners were French Jews. They were somber and tearful, we all were. We're all family, truly, and the loss of Jews anywhere in the world is a loss for us all. But to me, I saw them mourning the loss of the Jewish community in France. I saw the realization amongst many of those assembled that their time in France was drawing short, that the country where they had built synagogues and businesses and families would soon no longer be able keep them safe, and they felt lost. And though the Israeli dignitaries who spoke to those assembled spoke beautifully about Israel being a home for all Jews, they spoke in Hebrew, a language different from their own. And you could see the love they all had for Israel, the Zionism that burns brighter in them than in most Jews I know back home in the States, but how that love doesn't negate the fears they have in leaving France for good, in starting over here. So for once, I tried to walk a few steps in their shoes. I tried to imagine my own home country becoming a place I no longer felt comfortable (G-d forbid). I tried to imagine being scared to wear a Magen David on the subway, even though I can now wear an Israeli flag on my back with no fear at all. I tried to imagine sending a child to school in Queens with four heavily armed guards at the entrance, rather than just the intercom systems we have now. I tried to imagine everyone I know being forced to sell the businesses that they worked on for years to make successful, and move to a country with a new language and a totally different economy. I tried to imagine having to uproot Bubbies and Zaidys, who already knew the pain of being a refugee, telling them they have to escape persecution again in their lifetimes. And I tried to imagine the place I grew up, loved and was so proud to call my home, suddenly no longer wanting me there. So while I couldn't truly step into their shoes, I was no longer judging. And while I might still sometimes lament why some of them choose to stay in France, I will welcome those who do decide to make aliyah with my arms open as wide as possible. Certainly, Israel is as much their home as it is mine, as it is the home for every Jew. I will work hard to understand that it is not always easy to leave one's home for one's Homeland, no matter how much you may love it. Most of all, I will do my part to help everyone I meet here in Israel feel like "une familly juive"- one Jewish family. Am Yisrael Chai.